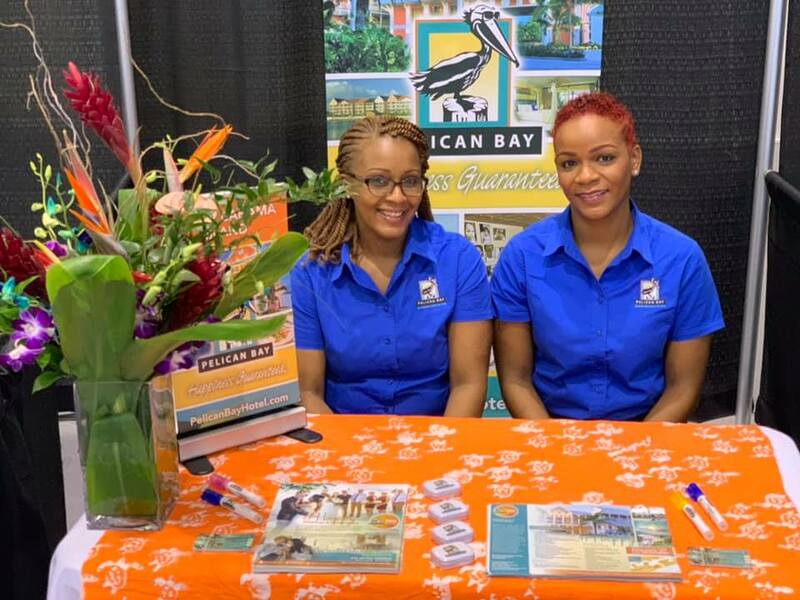 Freeport, Bahamas – With more than $4 million dollars invested in room renovations last year, Pelican Bay seized the opportunity to promote their new décor and upgraded facilities at the recent 2019 Caribbean Hotel Tourism Association’s (CHTA) Caribbean Travel Marketplace held in Montego Bay, Jamaica. Known as the ‘Happiest Hotel’ on Grand Bahama, Pelican Bay was represented at CHTA by Operations Manager Della Bridgewater and Reservations Supervisor Dominique Smith. The team joined over five hundred industry delegates representing over 147 companies all showcasing their destinations to tour buyers and vacation companies. The trip to CHTA Caribbean Travel Marketplace is a continuation of the momentum surrounding the hotel’s unveiling of forty-five newly renovated rooms last December. The property is presently renovating an additional forty-two rooms, which are expected to be completed and available for booking by the end of March. The upgraded facilities incorporate a vibrant European décor with island accents, and include new furniture, new bathroom fixtures, new technology, and new air-conditioning units. Corporate and Leisure guests of the hotel can look forward to enjoying an authentic Bahamian island experience with more style, comfort and relaxation. Now in it’s 37th year, CHTA Caribbean Travel Marketplace is the leading tourism event where delegates from Caribbean countries meet buyers from around the world. This year’s event hosted the first ever contingent of Chinese travel buyers, in addition to sixty new companies from Argentina, Brazil, Canada, Colombia, India, Mexico, Panama, Peru, Poland, Puerto Rico, St. Vincent & The Grenadines, Switzerland, the United Kingdom, and the United States. Freeport, Bahamas – Three months after the first #Be A Hero presentation took to an auditorium in Nassau with a message to hundreds of youngsters that no one is too young to take pride in a clean room, school or street, the popular caped crusader campaign went national this week – its first visit outside the capital fittingly in the nation’s second city, Freeport.Minister of Environment and Housing Romauld ‘Romi’ Ferreira drummed up support for the cleaner, greener, safer communities’ initiative by challenging students at Bishop Michael Eldon Primary School in Grand Bahama.“Today is a very exciting day for me,” said Ferreira. 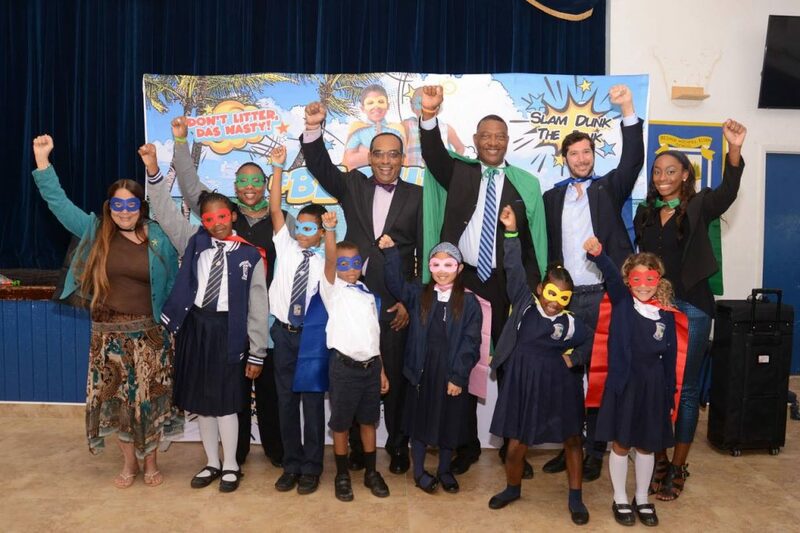 “I am so pleased to kick off the launch of the national #Be A Hero campaign right here in Grand Bahama. Your island has always had a tradition of keeping the island clean, so this is nothing new to you. We expect great things from Grand Bahama and we expect you to be leaders in this campaign.”The visit to Bishop Michael Eldon Primary was the 19th visit to a primary or junior high since the #BeAHero team began delivering the anti-litter and take pride in your surroundings message, in a way that would appeal to students; complete with superhero capes, masks, backdrop and group participation. With national heroes like basketball greats NBA’s Buddy Hield and WNBA’s Jonquel Jones, track stars like Olympic Gold medalist Shaunae Miller-Uibo and Golden knight Chris ‘Fireman’, entertainers like Kirkland ‘KB’ Bodie and Wendy and Dyson Knight and civic leaders like Ed Fields and Nancy Kelly as models in the campaign, the minister and team challenge students to compete for their schools to win the right to replace hero images throughout New Providence and become heroes themselves by identifying and carrying out a clean-up and beautification project that makes a difference. Projects can be on school grounds or in communities with before, during and after photos posted on the campaign’s active social media platforms including #ReplaceTheHeroes Contest. Winners will be announced before the end of the school year.“This program was initially only intended for Nassau to instill in young people the message that this is their land and keeping it clean and green is their responsibility,” said the minister. “But when schools in Nassau started posting their projects on line, students from Abaco and Grand Bahama wanted to join and we welcome the opportunity to expand. We will take this nationwide and visit as many islands as we can. To change the culture and create a cleaner, greener Bahamas in the future, we have to start with the young and we are discovering that they understand and want to find creative ways to make that difference we are seeking.” In Grand Bahama, local leaders and environmentalists turned out to show support for the first national extension of the initiative. Among them were Rupert Hayward, Executive Director, Grand Bahama Port Authority and its Keep Grand Bahama Clean Campaign, Rashema Ingraham, Executive Director of Save The Bays, and Gail Woon, President of Earth Care. 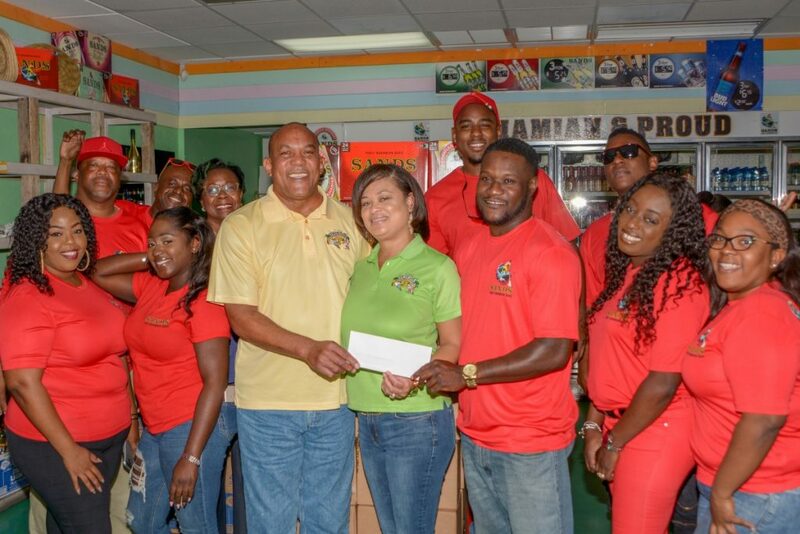 Expenses of the program designed in partnership by Barefoot Marketing, Grand Bahama, and Diane Phillips & Associates, Nassau, have been borne in large part by corporate sponsors including The Tribune, AML Foods, Atlantis, Bahamas Wholesale Agencies, Bahamas Waste, Commonwealth Brewery, Kelly’s Home Centre, Seaside Media, Solomon’s, Subway and The Sign Man. 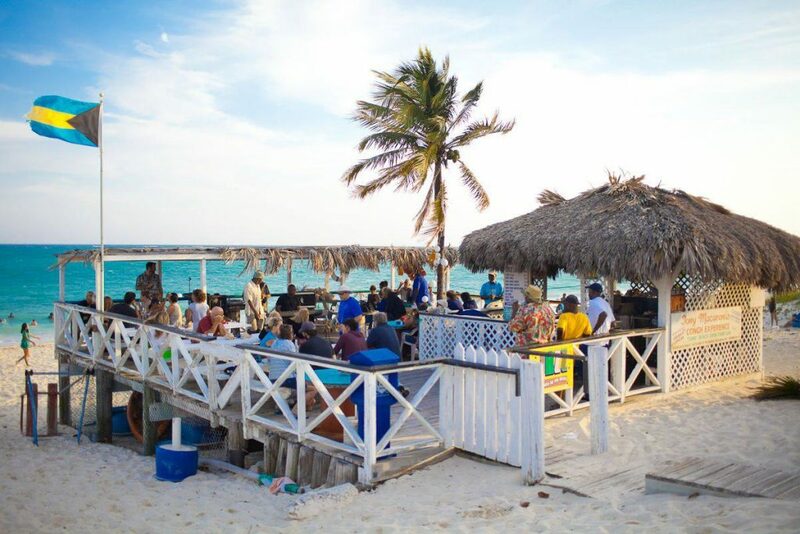 New Providence, Bahamas – With fans spanning the globe, The Bahamian Brewery and Beverage Company (BBB) has redefined the beer business in The Bahamas, by providing quality products and beers – like their signature Sands, Sands Light and Sands Pink Radler. Known for rewarding their fans for their loyalty through various social media promotions, contests, and celebrations at their brewery, Sands has now included an Alaskan Cruise giveaway! Two years ago, during the Brewery’s 10 year anniversary celebrations, the company introduced a national Scratch & Win promotion, giving their fans across The Bahamas the opportunity to literally scratch & win their way to scores of instant prizes: from free beer, cash on the spot, and stylish Sands merchandise. Late last year, BBB reintroduced its popular Scratch & Win promotion, this time upping the ante by offering daily prizes, as well as a chance to win a grand prize package: an Alaskan Cruise for two. Each week, scores of customers made their purchases of Sands, Sands Light, or Sands’ Pink Radler from any Jimmy’s Wines & Spirits locations as well as selected retailers in hopes of snagging instant prizes. “Because our customers have come to know and love our Scratch & Win Promotion, our newest Sands promotion was all about offering a one of a kind vacation experience– a nice getaway off the rock,” noted Seymour. After the Christmas celebrations, Keith Mackey, a resident of New Providence who bought 3 cases of Sands, had his name drawn as the winner from the scratch off entries. He and his wife, have now won an all-expense paid trip to cruise on the Norwegian Joy in May 2019. The Mackeys will be treated to the ultimate travel experience including flights to Seattle Washington, followed by a seven day adventure which will take them to Alaska ports in Ketchikan, Juneau, Icy Strait Point, as well as stops in Victoria, British Columbia’ allowing them to explore the wilds of Alaska, or to just chill on board watching for whales, or take a turn on the ships on board racetrack. The Brewery which has seen its expansion grow over three times its original size and with stores in 5 islands is looking forward to more competitions in 2019. “Our owner, Mr. Sands, is a firm believer in giving back to his supporters,” noted Seymour. “We are working on new campaigns all the time and expanding our products too. 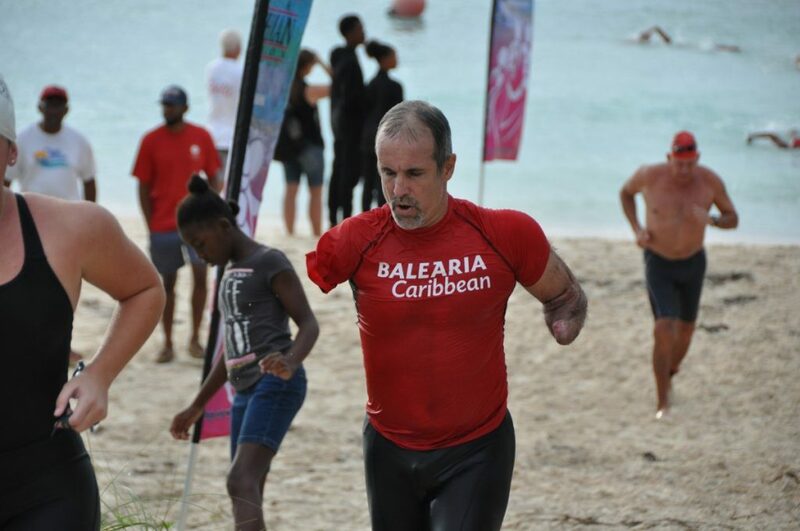 Freeport, Bahamas – The overwhelming support shown for the GBPA Conchman Triathlon last November, from triathletes near and far, has prompted the organizing committee to begin early registration for the increasingly popular competition scheduled for Saturday, November 2nd on Taino Beach in Freeport. Interested persons can register online now at www.conchmantriathlon.com. All event categories are open, including Individual Sprint, Individual Olympic, Relay Team, Corporate Challenge, Secondary School Challenge and the crowd favorite, the IronKids Competition. Take advantage of the 50% off early registration discount presently being offered until September 30th. The $50 fee for the Sprint is the lowest Registration Fee in the Caribbean. The 33rd Annual GBPA Conchman Triathlon is expected to draw large numbers again this year. A record two hundred athletes participated in the event last year, forty-six teams competed in various categories, and over thirty participants travelled to Grand Bahama to compete. Chairman Christopher Baker is encouraged by the positive feedback the committee has received from competitors and is confident Conchman will continue to attract athletes from other countries and the family islands to Grand Bahama. He attributed a lot of Conchman’s success to the support of the event’s sponsors. The Grand Bahama Port Authority (GBPA) is the title sponsor of Conchman Triathlon. Other sponsors include Scotiabank, BTC, Bahamas Paradise Cruise Line, Pharmachem, UNEXSO, BWA, Barefoot Marketing, Kelly’s, Freeport Ship Services, Atlantic Medical, 242newsbahamas, and Viva Wyndham Fortuna Beach. For more information on Conchman Triathlon 2019 visit www.conchmantriathlon.com or Facebook https://www.facebook.com/conchmantriathlon/.